Strong is good and happy. Who doesn’t want to be a strong? Perhaps everyone wants to be and for it one has to do some physical exercises or choose a good combat sport which makes you strong by practicing it and also teaches you some fighting skill and moves. If you are thinking that which sport you should choose for both becoming strong and as well as also teaches you about combating then I think wrestling is best one that one can opt for. Wrestling is one of the best combat sports today that is being practice by many professional and freshers around the world. There is a governing body of this sport that governs it all around the world with specific standards for playing it. There can be amateur and professional wrestling and many other different types of it. From them, one type is free style wrestling. 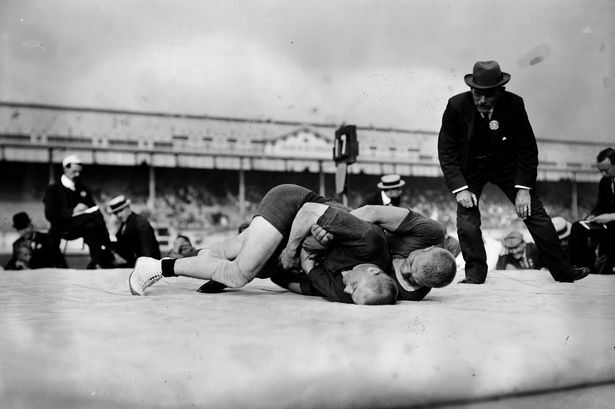 Freestyle wrestling is a type of amateur wrestling that is contested in the Olympic Games. In this type of wrestling one has to throw and pin opponent to the mat and one who does this, wins. Freestyle wrestling is a type of complete stand up wrestling which is a combination of judo, sambo techniques and wrestling. It is one of the four forms of free style amateur competitive wrestling which is practiced internationally. If you want to train under a professional then there is two time wrestling world champion and Olympic bronze medalist Vougar Oroudjov who can train you for free style wrestling. You must be thinking that how you can learn this sport and must be very eager to learn it because you also want to be strong and powerful like wrestlers. Then there are many professional who teach this sport and you can get training under them and there are also summer wrestling camp which are arranged for learning this sport. It can be in colleges and schools and near your town. Training at summer camps can be a good beneficial where you can learn with others same like your age and older than you. It can be really beneficial where you can see learning it and also learn yourself. It is the combat sport of right techniques and of deep knowledge where it can take months and years to master it by practicing regularly. If someone wants to take it as career option then training at summer camp is the best option one can do where the guidance of professionals are always ready to help you in techniques and methods. VHW (Vougar’s Honors Wrestling) club was established in 2006 by two time freestyle wrestling world champion and Olympic bronze medalist Vougar Oroudjov. Vougar has transformed his successful wrestling career to coaching by transferring his knowledge and experience to children of all ages and skill levels including those with special needs. Vougar’s passion for wrestling, his skills, and his techniques have contributed to his success as well as to the success of his students. Vougar is not only a successful wrestler but also an experienced coach, trainer, and leader. He has 13 years of coaching experience and he is currently one of the wrestling coaches for Nassau Community College. At his wrestling club he has trained numerous county and state wrestling champions. Many of his alumni have gone on to Ivy league Universities such as Harvard, Cornell, American, Northwestern, Ohio State, Indiana, Michigan, NYU, and Hofstra, among others. Vougar helps his students reach their fullest abilities athletically as well as helping them through the college application process. He guides his students to colleges that will allow them to succeed not only in wrestling but, in their future careers. Vougar not only has a good rapport with all of the students, but also with the parents involved in the club. He takes an interest in the needs of his students as individuals and helps them to achieve their goals. He genuinely loves the sport of wrestling and cares about his students and their families. He has formed a close bond with the students and parents that have joined his club and they have become in a sense, part of his family. Vougar works year round including the off season and accompanies his students to wrestling tournaments. He is committed to his career, his students, and their families. VHW instills discipline, dedication and a sense of pride in its students and emphasizes the importance of academics as well as athletics. Vougar’s hope is that all of his students will excel at the college of their choice whether they continue to wrestle or not. VHW builds confidence for future success, not only in wrestling, but in all aspects of life. Vougar’s Honors Wrestling club offers a summer camp . Vougar, founder of VHW, is a two time freestyle wrestling world champion and Olympic bronze medalist. He has been a trainer and coach for 13 years and is currently one of the wrestling coaches at Nassau Community College. He was voted 2012 NJCAA Coach of the Year. VHW (Vougar’s Honors Wrestling) club offers a summer camp created to increase student’s wrestling skills. Camp is open to all ages and levels of experience. At VHW, you will learn the techniques needed to take your abilities to the next level. Vougar has personally trained numerous County and State wrestling champions. VHW wrestlers have achieved College All-American, High School All-American, New York State Champion, All-State, County Champion, and All-County. Vougar always brings the most successful and experienced coaches to run his program and assist him for a better result. VHW Summer wrestling camp focuses on improving skills through hard work, drive, and determination. Students of all ages and skill levels can attain the discipline and dedication that they need to achieve their goals. The program helps build the confidence needed to succeed not only in wrestling but, in all aspects of life. At the end of each weekly session, a celebration barbeque / pool party is held.